From one of my least favorite 18th century dresses to one of my favorites. 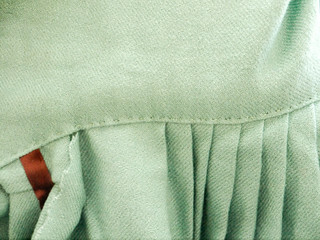 Today's post is about the Mint Chip dress. 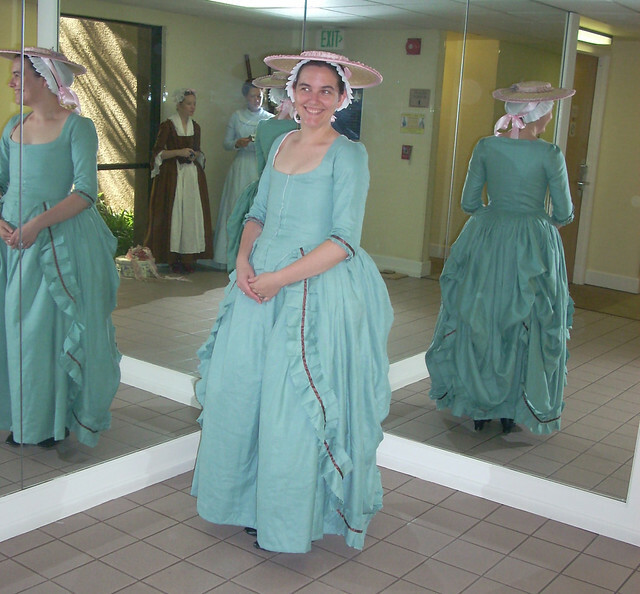 The theme of Costume College in 2009 was 18th century so I decided I would go all out with a crazy 18th century wardrobe. 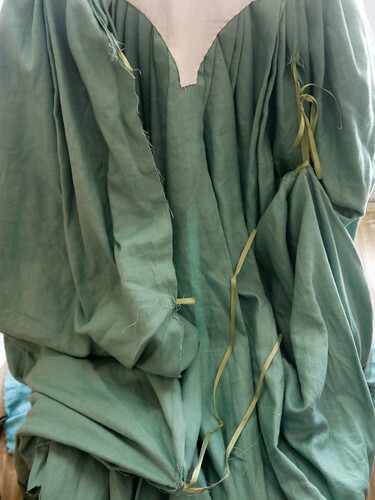 Katherine (Koshka of The Fashionable Past) had found a ton of green wool blend fabric for a great price on ebay and crowdsourced the buying of it. I bought ten yards and thus the Mint Chip was born. 5 years later and I desperately need to remake them. Ha! I'm still traumatized. 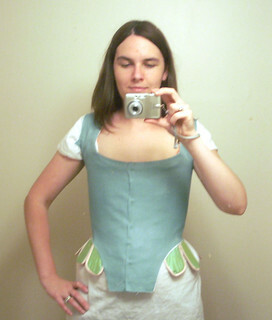 I don't have pictures of the fitting process for the pattern block, but I do have in progress bodice fitting pictures. 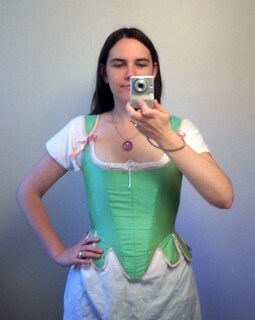 Honestly, I'm still proud of the fit on my 18th century stuff, especially this dress. All of my 18th century things have been fitted off this block - from Felicity's birthday dress all the way to the Portrait Dress. It's the greatest. The sleeves were made from the same 18th century sleeve pattern I've been using since I made the Colonial Coquette in 2005. The thought occurs that maybe I should do a blog post about that insanity, but I digress. My sleeve philosophy is "If it ain't broke, don't fix it" because sleeves are the devil and better the devil you know than the devil you don't. Have you had enough pithy sayings now? 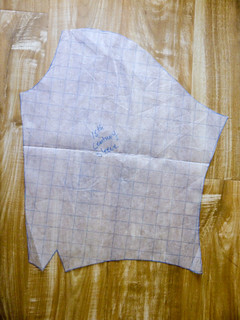 Sleeve pattern, you haven't failed me yet. 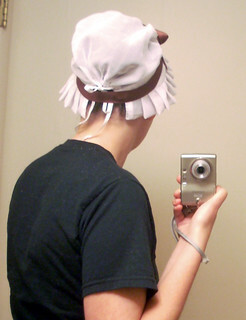 The trims are a self fabric ruffle and brown silk ribbon. 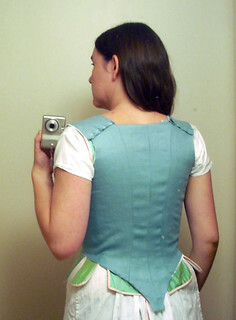 I totally fudged the sewing of the trims because I was in a hurry so I just kind of zig zagged and hoped for the best. 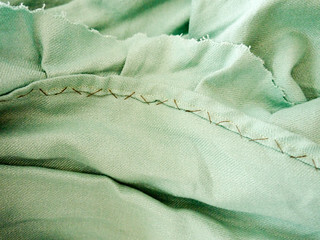 There are some nice hand sewn details though. 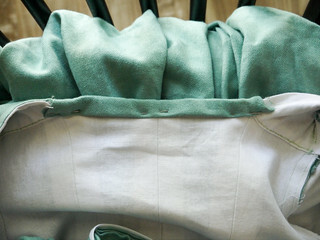 My obsession with bag lining shows on the neckline, but I did hand stitch the waistline seams and center fronts. 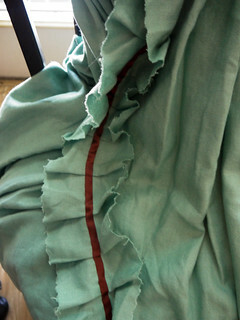 I decided to make it a polonaise so I sewed two loops into the seams of the skirt with ties towards the bottom. I mostly just eyeballed the placement because measuring things is for the weak. Apparently trimming your threads is for the weak as well. I couldn't sew down the binding, but accessories were a must because logic! The cap was made while waiting two hours for the midnight showing of Harry Potter and the Half Blood Prince. I love this little thing. 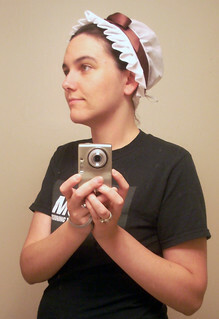 It's made from a very lovely cotton batiste using the Fleur De Lyse cap pattern and is completely hand sewn. Such a fun dress to make and wear!